Summer theme for 2014 is: Fizz! Boom! Read! Special activities on Tuesdays at 9:30 and/or Wednesdays at 1:30 pm. Any child may be signed up for any or all sessions individually, but space is limited so please call to cancel if your plans change and you will NOT be coming. Summer Reading: Each child will have a reading certificate, and by reporting how much is read per week, will be able to choose small prizes and add to the wall display. 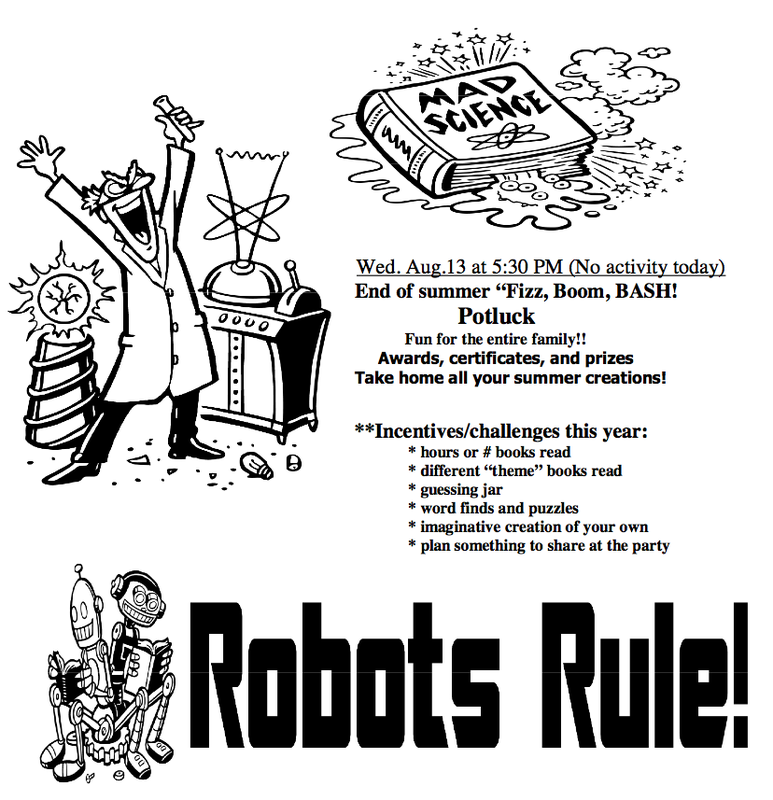 A pot luck picnic on the last Wednesday (Aug. 13 in 2014) at 5:30 PM for all participants and their families. 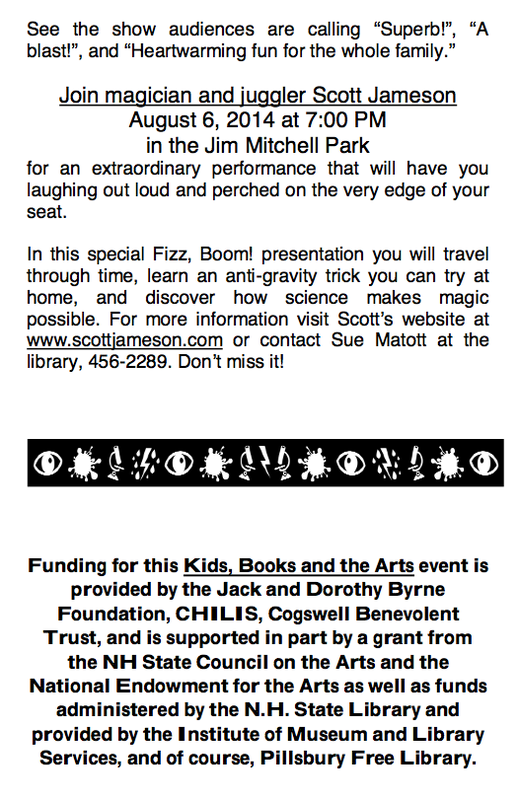 A special performance: Wed. August 6 at 7:00 PM (No activity that day) Amazing show featuring Scott Jameson at Jim Mitchell Park (Town Hall if rain), free, and fun for the entire Family! 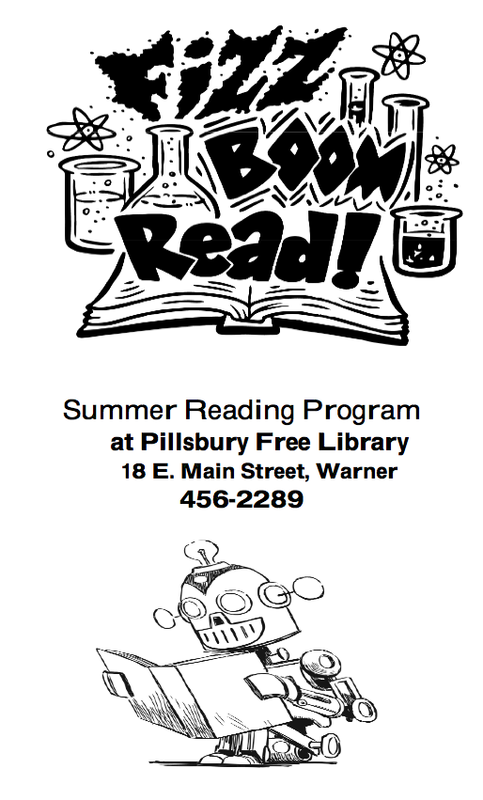 It is open to the public, not only for the summer program participants. Preschool Story Time: held every Thursday at 10:30 AM for ages 1 to 4. Stories, rhymes, and a simple activity with parents help last about 1 hour in all. A great place to meet other parents. No sign up required.